A few weeks ago, I had breakfast with someone who was planning to start Rabbinical school at the Jewish Theological Seminary. After the meeting, he emailed me about a book called A Delightful Compendium of Consolation by Rabbi Burton Visotzky, who teaches at JTS. 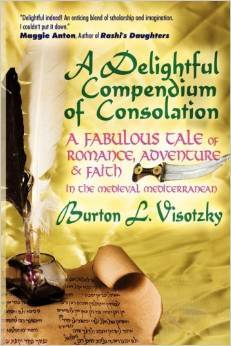 A Delightful Compendium is historical fiction and traces the lives of a Karaite Jewish family as they navigate through the Middle Ages. The family members struggle to hold onto their Karaite identity as a minority in the Jewish world. Today, I am excited to catch up with Rabbi Visotzky about his book, A Delightful Compendium. Archie’s rejoinder is interesting on many levels. If (as according to Christian theology) Jesus is the son of God, Jesus’ non-maternal lineage actually bolsters (not lessens) the point that Archie should not have ill-feelings towards Jews. Archie’s response also strikes another religious chord; according to generally accepted Jewish beliefs, a child is Jewish if his mother is Jewish. Under this view, Jesus’ maternal Jewish lineage is the all that matters, which also supports Archie’s son-in-law’s argument. Apparently, the writers of All in the Family were not Karaites.